In this practice one visualizes Amitabha and his retinue and recites his six syllable mantra. 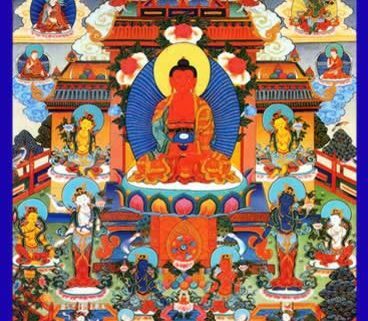 Through this practice we purify our obscurations and accumulate merit and wisdom while cultivating the causes for rebirth in Dewachen, Amitabha’s pureland. This is a traditional practice associated with death and dying in many Mahayana and Vajrayana buddhist traditions. During this event we will offer prayers and the lighting of candles for beings who have recently deceased and for all beings.